City of entertainment. City of excess. 1,700 metres above sea level. Waay over the top. Genting wasn’t a holiday. We were there for a shoot. But having not visited in at least 15 years, we stupidly thought we might be able to squeeze in a bit of R&R. Enjoy the fresh air. Take in the scenery. Chill. Boy, were we in for a shock. We had to take a number just to check into the 6118-room First World Hotel. The place was booked solid. Tourists everywhere. Kids screaming. Lost grandparents stuck their heads into random lifts, asking people if they’d seen their relatives. Our room was tiny. The only window looked directly into another room. There was no satellite or cable TV. No soap in the bathroom. No room service. 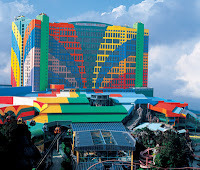 For entertainment, there was the casino, the amusement park, the mall, and the mall. Being in Genting was kinda like being stuck in a giant shopping complex. With no exit. And a lot of people. The gazillionaire who built the place was nice enough to add a few thoughtful touches. Like the ferris wheel in the middle of the foodcourt. The fake gondola ride right next to the coffee joint. Oh, and the rollercoaster inches away from the internet cafe. Writing an email to the screams of teenaged thrillseekers was so, so much fun. We’re home now. Still in shock. Not much time to recover though. We have to go back again for another round of filming this weekend. Oh joy.